Back to Work provides a foundational plan for returning a horse to work after an injury or extended time-off. Some of the industry’s top veterinarians explain several of equestrian sport’s more common surgeries, injuries, and illnesses and then provide a practical guide to the basic steps one should take when bringing a horse back to work. 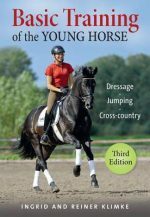 Readers are then inspired by true stories of riders and horses from various equestrian disciplines, injuries, climates, and ages, as they share tips and advice on what did and did not work for them. Additional riders who have succeeded in rehabbing horses join other equine experts in a special chapter featuring recommended tips, therapies, and treatments. Finally, an inspiring group of stories explains riders’ struggles to get back in the saddle after their own injury or illness, including the frustrations and challenges they faced, and the successes they ultimately experienced. Readers will not only find valuable practical information for specific rehab scenarios (both horse and human), they will also find inspiration for their daily equestrian lives.